Sometimes it seems like the best way to review something terrific is to just lean back and say, “You must go, see for yourself. It’s wonderful.” “Opus” at the Fountain Theatre is just such a gem. It is 90 minutes of tightly written and meticulously acted theater, entertaining and thought provoking. You probably would like me to tell you why you should go, but to do it without too much dissection. I will try. The bare outline is this: the fictional Lazara String Quartet has enjoyed critical acclaim and has been invited to play at the White House. The time is post-9/11, during the Bush administration. They are less than enthusiastic about performing for this president–“none of us voted for him”–but hey, it is the White House and that is exciting. “Play [Hail to the Chief ] like you voted for him.” The command performance is in a few days. They must rehearse, but their violist has disappeared for over a week. Apparently this does not come out of nowhere; he has had serious emotional problems. The other three men are losing patience. They have decided, not without acrimony, that he must be replaced, but by whom? Their old violist was brilliant. No one is enthusiastic about the guy they see as their only choice to replace him. But what can you do? Enter Grace (Jia Doughman), an attractive young woman, just out of graduate school. She is timorous, but determined. Her playing is equal to their reputation. “Opus” is about the inevitable friction between the players that takes place in intense relationships and the kind of complications that can ensue when a new member enters a group that has been together, night and day, for years. That she is a woman is not a minor factor. So nuanced is the acting that not only do they capture the personalities, they have even the minor gestures you would see if they were such a quartet. Playwright Michael Hollinger started life as a violist, and it informs “Opus” on many levels. Director Simon Levy was a music major, too. Even costume design comes with a name carrying a musical echo: A. Jeffrey Schoenberg. (But, to be honest, nowhere does it say his musical connection is significant.) As if Hollinger and Levy’s musical credentials were not enough, two musical advisers from the LA Philharmonic were hired to coach and arranged for the actors to attend a private rehearsal at Disney Hall. The careful preparation shows. Watching “Opus,” it is hard to believe that the actors in front of you are not musicians, or for that matter, that they are not a real quartet performing before you. Check their left hands as they appear to be playing. The left hands are stationary. When the Fountain obtained the rights to “Opus,” it also obtained the rights to the music performed by the Vertigo String Quartet for the original Arden Theatre Company of Philadelphia. The fragments that are played are beautiful. The Lazara Quartet is fictional, but the essence of this story has happened before, and will happen again. 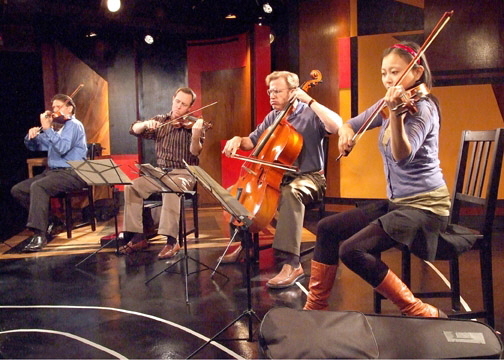 In December of 2005, NPR aired a story about the fracture in the Audubon Quartet, one of the top string quartets in the world at that time. They had even performed for President Carter. NPR’s Robert Siegel described the events of their breakup as being “about music, friendship, and business all gone awry.” “Opus” is all of that and more.